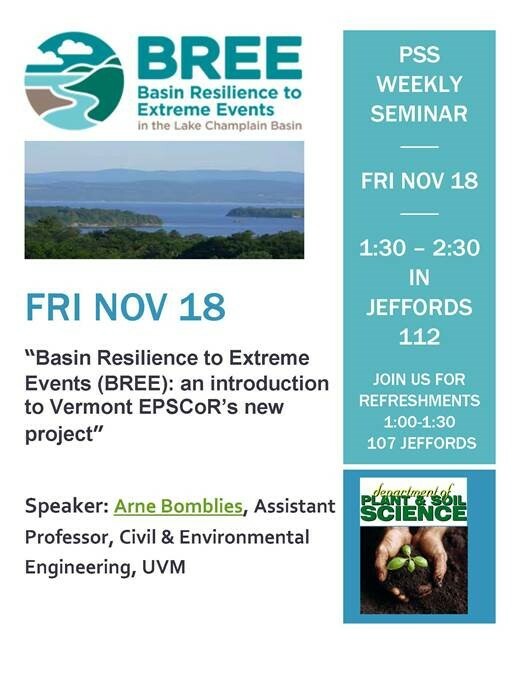 Title: "Basin Resilience to Extreme Events (BREE): an introduction to Vermont EPSCoR’s new project"
Dr. Arne Bomblies will present the research focus of Vermont EPSCoR’s new $20 million National Science Foundation grant, which began in June 2016. The research seeks to better understand and model the social-ecological system of the Lake Champlain Basin, with an emphasis on extreme event impacts on lake water quality. Dr. Bomblies will discuss the interdisciplinary nature of this five-year project, the research questions, and how the current research builds on Vermont EPSCoR’s prior grant (Research on Adaptation to Climate Change).